The Trump Administration has proposed a $19.1 Billion NASA budget request for Fiscal Year 2018, which amounts to a $0.5 Billion reduction compared to the recently enacted FY 2017 NASA Budget. 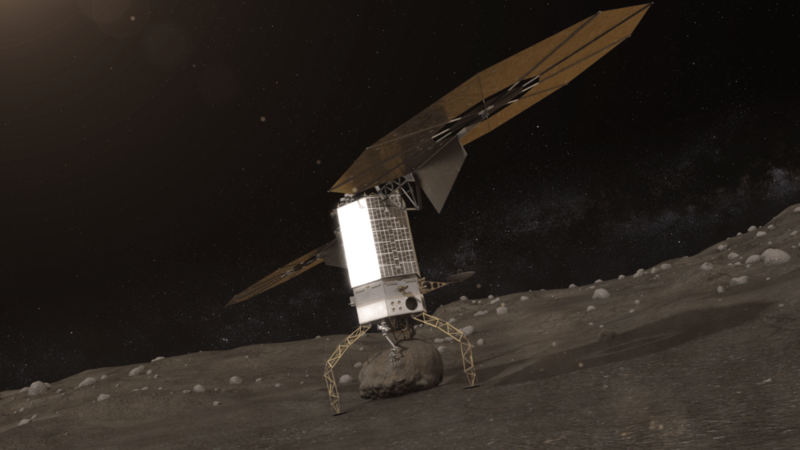 Although it maintains many programs such as human spaceflight, planetary science and the Webb telescope, the budget also specifies significant cuts and terminations to NASA’s Earth Science and manned Asteroid redirect mission as well as the complete elimination of the Education Office. Overall NASA’s FY 2018 budget is cut approximately 3%, or $560 million, for the upcoming fiscal year starting in October 2017 as part of the Trump Administration’s US Federal Budget proposal rolled out on May 23, and quite similar to the initial outline released in March. The cuts to NASA are smaller compared to other Federal science agencies also absolutely vital to the health of US scientific research – such as the NIH, the NSF, the EPA, DOE and NIST which suffer unconscionable double digit slashes of 10 to 20% or more. The highlights of NASA’s FY 2018 Budget were announced by NASA acting administrator Robert Lightfoot during a ‘State of NASA’ speech to agency employees held at NASA HQ, Washington, D.C. and broadcast to the public live on NASA TV. Lightfoot’s message to NASA and space enthusiasts was upbeat overall. “What this budget tells us to do is to keep going!” NASA acting administrator Robert Lightfoot said. Lightfoot recalled the recent White House phone call from President Trump to NASA astronaut & ISS Station Commander Peggy Whitson marking her record breaking flight for the longest cumulative time in space by an American astronaut. Thus Lightfoot’s vision for NASA has three great purposes – Discover, Explore, and Develop. Lightfoot further recounted the outstanding scientific accomplishments of NASA’s Mars rover and orbiters paving the path for the agencies plans to send humans on a ‘Journey to Mars’ in the 2030s. Lightfoot also pointed to upcoming near term science missions- highlighting a pair of Mars landers – InSIGHT launching next year as well as the Mars 2020 rover. Also NASA’s next great astronomical observatory – the James Webb Space Telescope (JWST). “The James Webb Space Telescope is built!” Lightfoot gleefully announced. JWST is the scientific successor to the Hubble Space Telescope and slated for launch in Oct. 2018. The budget maintains steady support for Webb. The Planetary Sciences division receives excellent support with a $1.9 Billion budget request. It includes solid support for the two flagship missions – Mars 2020 and Europa Clipper as well as the two new Discovery class missions selected -Lucy and Psyche. NASA is currently targeting the first integrated launch of SLS and Orion on the uncrewed Exploration Mission-1 (EM-1) for sometime in 2019. Top NASA managers recently decided against adding a crew of two astronauts to the flight after conducting detailed agency wide studies at the request of the Trump Administration. NASA would have needed an additional $600 to $900 to upgrade EM-1 with humans. Unfortunately Trump’s FY 2018 NASA budget calls for a slight reduction in development funding for both SLS and Orion – thus making a crewed EM-1 flight fiscally unviable. The budget request does maintain full funding for both of NASA’s commercial crew vehicles planned to restore launching astronauts to low Earth orbit (LEO) and the ISS from US soil on US rockets – namely the crewed Dragon and CST-100 Starliner – currently under development by SpaceX and Boeing – thus ending our sole reliance on Russian Soyuz for manned launches. However the Trump Administration has terminated NASA’s somewhat controversial plans for the Asteroid Redirect Mission (ARM) – initiated under the Obama Administration – to robotically retrieve a near Earth asteroid and redirect it to lunar orbit for a visit by a crewed Orion to gather unique asteroidal samples. Key among those vital capabilities to be retained and funded going forward is Solar Electric Propulsion (SEP). The Trump Administration’s well known dislike for Earth science and disdain of climate change has manifested itself in the form of the termination of 5 current and upcoming science missions. NASA’s FY 2018 Earth Science budget suffers a $171 million cut to $1.8 Billion. The DSCOVR Earth-viewing instruments will also be shut down. NASA’s Office of Education will also be terminated completely under the proposed FY 2018 budget and the $115 million of funding excised. Congress will now have its say and a number of Senators, including Republicans says Trumps budget is DOA. The Obama Administration today (Feb. 2) proposed a NASA budget allocation of $18.5 Billion for the new Fiscal Year 2016, which amounts to a half-billion dollar increase over the enacted budget for FY 2015, and keeps the key manned capsule and heavy lift rocket programs on track to launch humans to deep space in the next decade and significantly supplements the commercial crew initiative to send our astronauts to low Earth orbit and the space station later this decade. NASA Administrator Charles Bolden formally announced the rollout of NASA’s FY 2016 budget request today during a “state of the agency” address at the Kennedy Space Center (KSC), back dropped by the three vehicles at the core of the agency’s human spaceflight exploration strategy; Orion, the Boeing CST-100 and the SpaceX Dragon. “To further advance these plans and keep on moving forward on our journey to Mars, President Obama today is proposing an FY 2016 budget of $18.5 billion for NASA, building on the significant investments the administration has made in America’s space program over the past six years,” Administrator Bolden said to NASA workers and the media gathered at the KSC facility where Orion is being manufactured. Bolden said the $18.5 Billion budget request will enable the continuation of core elements of NASA’s main programs including first launch of the new commercial crew vehicles to orbit in 2017, maintaining the Orion capsule and the Space Launch System (SLS) rocket to further NASA’s initiative to send ‘Humans to Mars’ in the 2030s, extending the International Space Station (ISS) into the next decade, and launching the James Webb Space Telescope in 2018. JWST is the long awaited successor to NASA’s Hubble Space Telescope. Funding is also provided to enable the manned Asteroid Redirect Mission (ARM) by around 2025, to continue development of the next Mars rover, and to continue formulation studies of a robotic mission to Jupiter’s icy moon Europa. “That’s a half billion-dollar increase over last year’s enacted budget, and it is a clear vote of confidence in you – the employees of NASA – and the ambitious exploration program you are executing,” said Bolden. Overall the additional $500 million for FY 2016 translates to a 2.7% increase over FY 2015. That compares to about a 6.4% proposed boost for the overall US Federal Budget amounting to $4 Trillion. The Boeing CST-100 and the SpaceX Dragon V2 will restore the US capability to ferry astronauts to and from the International Space Station (ISS). In September 2014, Bolden announced the selections of Boeing and SpaceX to continue development and certification of their proposed spaceships under NASA’s Commercial Crew Program (CCP) and Launch America initiative started back in 2010. Since the retirement of the Space Shuttle program in 2011, all NASA astronauts have been totally dependent on Russia and their Soyuz capsule as the sole source provider for seats to the ISS. CCP gets a hefty and needed increase from $805 Million in FY 2015 to $1.244 Billion in FY 2016. To date the Congress has not fully funded the Administration’s CCP funding requests, since its inception in 2010. As a result, NASA has also been forced to continue paying the Russians for crew flights aboard the Soyuz that now cost over $70 million each under the latest contract signed with Roscosmos, the Russian Federal Space Agency. Bolden has repeatedly stated that NASA’s overriding goal is to send astronauts to Mars in the 2030s. 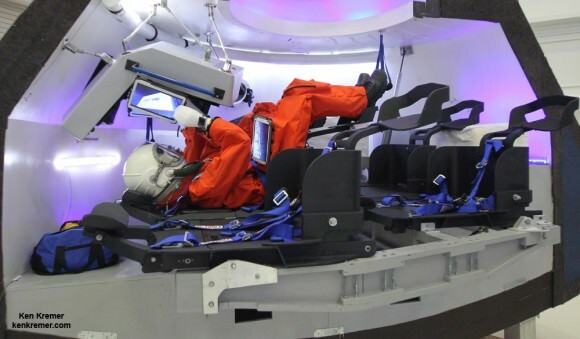 To accomplish the ‘Journey to Mars’ NASA is developing the Orion deep space crew capsule and mammoth SLS rocket. However, both programs had their budgets cut in the FY 2016 proposal compared to FY 2015. The 2015 combined total of $3.245 Billion is reduced in 2016 to $2.863 Billion, or over 10%. The first test flight of an unmanned Orion atop the SLS is now slated for liftoff on Nov. 2018, following NASA’s announcement of a launch delay from the prior target of December 2017. Since the Journey to Mars goal is already underfunded, significant cuts will hinder progress. Orion just completed its nearly flawless maiden unmanned test flight in December 2014 on the Exploration Flight Test-1 (EFT-1) mission. There are some losers in the new budget as well. Rather incomprehensibly funding for the long lived Opportunity Mars Exploration Rover is zeroed out in 2016. This comes despite the fact that the renowned robot just reached the summit of a Martian mountain at Cape Tribulation and is now less than 200 meters from a science goldmine of water altered minerals. Funding for the Lunar Reconnaissance Orbiter (LRO) is also zeroed out in FY 2016. Both missions continue to function quite well with very valuable science returns. They were also zeroed out in FY 2015 but received continued funding after a senior level science review. So their ultimate fate is unknown at this time. Overall, Bolden was very upbeat about NASA’s future. “I can unequivocally say that the state of NASA is strong,” Bolden said. 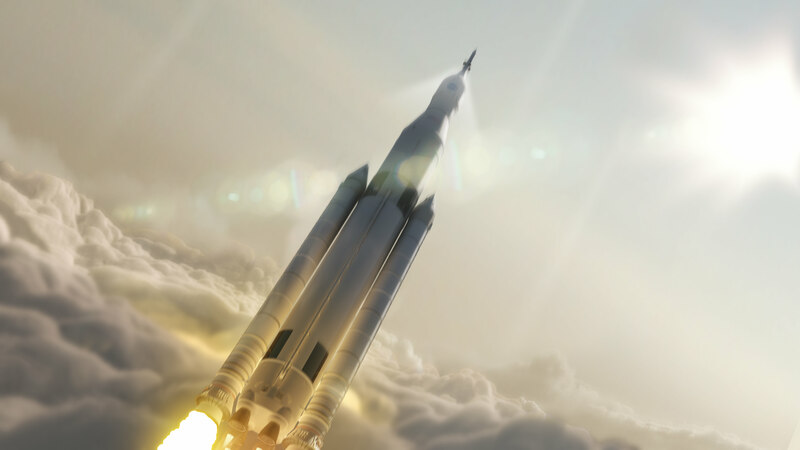 After a thorough review of cost and engineering issues, NASA managers formally approved the development of the agency’s mammoth heavy lift rocket – the Space Launch System or SLS – which will be the world’s most powerful rocket ever built and is intended to take astronauts farther beyond Earth into deep space than ever before possible – to Asteroids and Mars. On its first flight known as EM-1, the SLS will also loft an uncrewed Orion spacecraft on an approximately three week long test flight taking it beyond the Moon to a distant retrograde orbit, said William Gerstenmaier, associate administrator for the Human Explorations and Operations Mission Directorate at NASA Headquarters in Washington, at the briefing. Previously NASA had been targeting Dec. 2017 for the inaugural launch from the Kennedy Space Center in Florida – a slip of nearly one year. But the new Nov. 2018 target date is what resulted from the rigorous assessment of the technical, cost and scheduling issues. He said that the development cost baseline for the 70-metric ton version of the SLS was $7.021 billion starting from February 2014 and continuing through the first launch set for no later than November 2018. Lightfoot emphasized that NASA is also building an evolvable family of vehicles that will increase the lift to an unprecedented lift capability of 130 metric tons (143 tons), which will eventually enable the deep space human missions farther out than ever before into our solar system, leading one day to Mars. 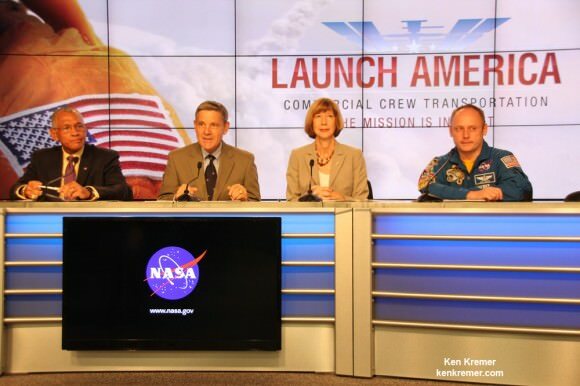 “It’s also important to remember that we’re building a series of launch vehicles here, not just one,” Lightfoot said. Lightfoot and Gerstenmaier both indicated that NASA hopes to launch sooner, perhaps by early 2018. “We will keep the teams working toward a more ambitious readiness date, but will be ready no later than November 2018,” said Lightfoot. The next step is conduct the same type of formal KDP-C reviews for the Orion crew vehicle and Ground Systems Development and Operations programs. The first piece of SLS flight hardware already built and to be tested in flight is the stage adapter that will fly on the maiden launch of Orion this December atop a ULA Delta IV Heavy booster during the EFT-1 mission. The initial 70-metric-ton (77-ton) version of the SLS stands 322 feet tall and provides 8.4 million pounds of thrust. That’s already 10 percent more thrust at launch than the Saturn V rocket that launched NASA’s Apollo moon landing missions, including Apollo 11, and it can carry more than three times the payload of the now retired space shuttle orbiters. The core stage towers over 212 feet (64.6 meters) tall with a diameter of 27.6 feet (8.4 m) and stores cryogenic liquid hydrogen and liquid oxygen. Boeing is the prime contractor for the SLS core stage. The pressure vessels for the Orion crew capsule, including EM-1 and EFT-1, are also being manufactured at MAF. And all of the External Tanks for the space shuttles were also fabricated at MAF. The airframe structure for the first Dream Chaser astronaut taxi to low Earth orbit is likewise under construction at MAF as part of NASA’s commercial crew program. 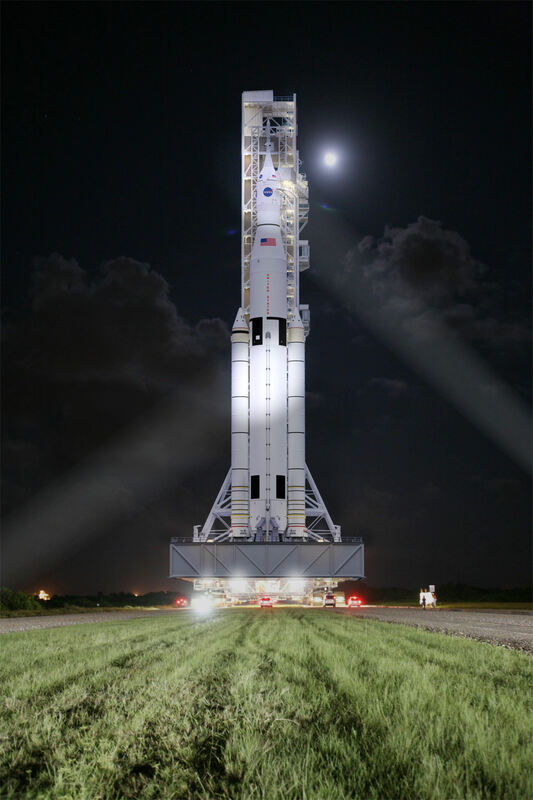 The first crewed flight of the SLS is set for the second launch on the EM-2 mission around the 2020/2021 time frame, which may visit a captured near Earth asteroid.